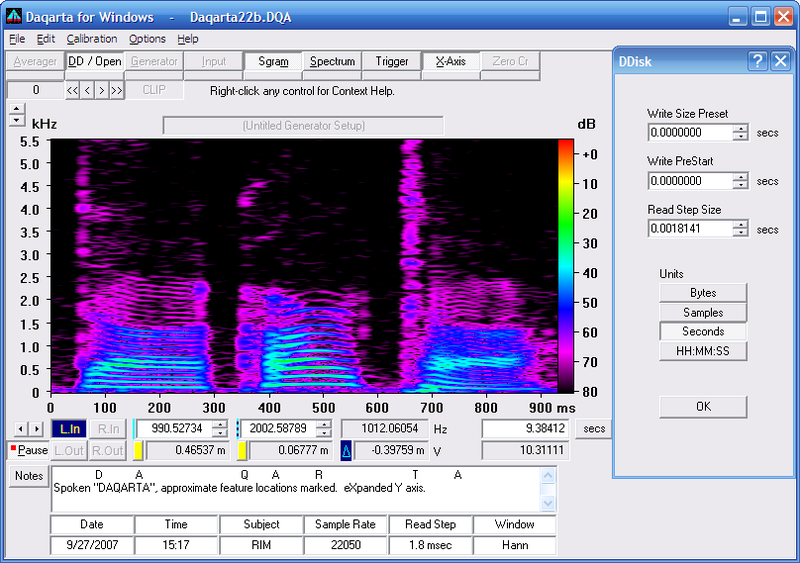 The cal file extension is associated with the Daqarta a scope, spectrum, spectrogram, signal generator software for Microsoft Windows operating system. The *.cal file stores extended audio data for the Daqarta. Use Daqarta to playback .cal audio data files. Programs supporting the exension cal on the main platforms Windows, Mac, Linux or mobile. Click on the link to get more information about Daqarta for play cal file action. Programs supporting the exension cal on the main platforms Windows, Mac, Linux or mobile. Click on the link to get more information about Daqarta for record cal file action. Programs supporting the exension cal on the main platforms Windows, Mac, Linux or mobile. Click on the link to get more information about Daqarta for export cal file action.